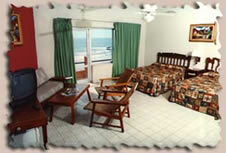 Hotel La Siesta Mazatlan has three stories, 58 rooms in second and third floors, many whit ocean view. The most desirable rooms are on the west, north and south side of the building and have a balcony whit great view of the ocean. Air conditioning, shower, direct dial telephone access and satellite TV. No pool. No elevator. 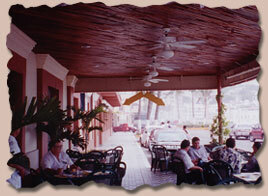 Hotel La Siesta Mazatlan is home of the World Famoso El Shirmp Bucket restaurant and bar. El Shirmp Bucket Mazatlan opens at 6:30 AM and closes at 11:00 PM. 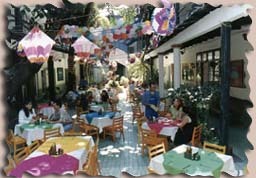 The courtyard is open for lunch and dinner during high season and air conditined indoors, year around. Room service all day. 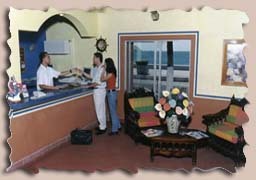 At the front desk, arrangement can be made for car rentals, city tours, harbor cruise, hunting and sport fishing. 24 hours laundry and dry cleaning if delivered at front desk before 9 am, same day services available if requested, travel agency on first floor, safety deposit boxes, english speaking doctor (on call). Banks at walking distance. Mazatlan's name comes from a Náhuatl Indian word "Mazatl" which means "Place of Deer." Mazatlan has about a half million residents and is one of Mexico's best billfish sport fishing areas. It has a very important commercial seaport. Although towns were first settled in this area about 400 years ago, a permanent colony was not established until the early 1820's with the first municipal government installed in 1827. The Museo de Arqueologia downtown has a small but good collection of pre-Columbian artifacts and exhibits of contemporary art. 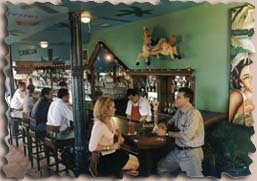 At the very southern end of town, before the malecon begins, is the actual port area. Here you can see large, modern ferry boats that ply the waters each night to La Paz, 235 miles northwest, across the Sea of Cortez. The trip takes 18 hours and sleeping cabins are available. Arrangements can be made at the ferry pier or through a travel agent.